Due west of the city of Pasto, Colombia, layer upon layer of ash, lava, cinders, and other volcanic debris pile up to form the Galeras Volcano. 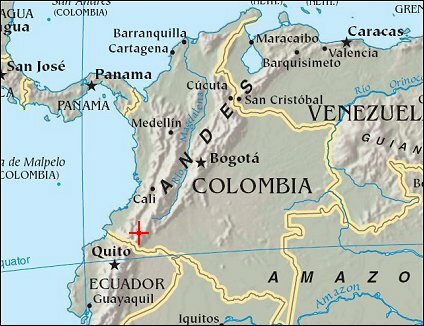 On May 24, 2005, Colombian officials ordered 9,000 people living near the flanks of the volcano to evacuate, as seismic activity increased and the threat of eruption loomed. According to reports (in Spanish) from Colombia’s Institute of Geology and Mining published on June 1, 2005, the volcano is likely to erupt in coming days or weeks. 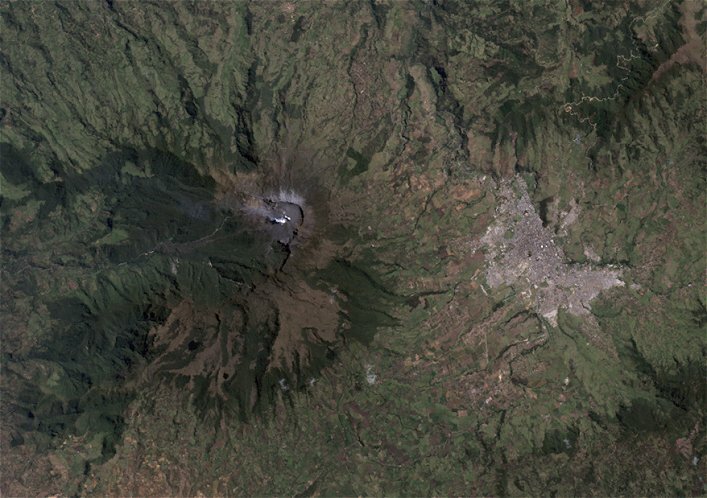 This image shows Galeras Volcano and the city of Pasto to its east. The caldera (crater) is the ash-colored, roughly circular feature to the left of image center. The caldera is not perfectly formed. Although a clear rim is visible on the eastern side of the caldera (casting a black shadow in this image), the western side is open. A charcoal-colored line running from the caldera through the green vegetation may be a lava flow or ash deposit. In the area surrounding the volcano, a patchwork of browns and greens shows just how close people are living and working the land near the volcano. Due east of the volcano is the city of Pasto, which appears as a grayish-tan patch amid the less-developed landscape. Galeras is one of Colombia’s most active volcanoes, with at least 20 eruptions since the 1500s. Approximately 400,000 people live within the volcano’s zone of influence.